We do our best to accommodate your busy schedule. We're open Monday through Friday from 8:00 a.m. – 4:00 p.m. Request an appointment today! We're a state-of-the-art ophthalmic practice delivering quality eye care in Greencastle. Learn more about all the services we provide. To make your visit as quick and comfortable as possible, we encourage you to download and fill out our patient forms before your appointment. "Dr. Facchina is friendly and wonderful! His staff is equally as amazing. They are very thorough with examinations. I have been having some trouble with corneal ulcers and needed a last minute appointment. They fit me in the schedule no problem. 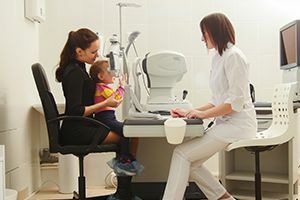 I have been to many eye doctor's over the years and was impressed with the quality and attentive care I received. I drive from 30 minutes away to see him. You will not be disappointed if you go here!" "Great Ophthalmologist. He has treated a few of my family members for various problems. His surgical results are excellent, and he is very knowledgeable about all aspects of eye care. He is very down to earth and easy to talk to. I would highly recommend him for any eye problem." Monday – Friday: 8:00 a.m. to 4:00 p.m. Request an appointment today!